The contribution of mosaicism to the development of Mendelian disease has been increasingly recognized as techniques sensitive to mosaic detection have been adopted as primary testing strategies. However, routine detection of mosaicism in conventional genome and exome sequencing is hampered by multiple factors. Assumptions inherent to genotyping and filtration strategies utilized by both genome and exome analysis often result in the dismissal or outright failure to call variants at allelic representations consistent with mosaicism. For those variants that are called as mosaic, false positives can be rampant, especially over paralogous sequence regions. Additionally, the overall lower read depths (typically ~30X) achieved in genome sequencing, and the wide variability in positional coverage achieved with conventional exome sequencing make the detection of mosaic variants difficult, especially at lower mosaic fractions. 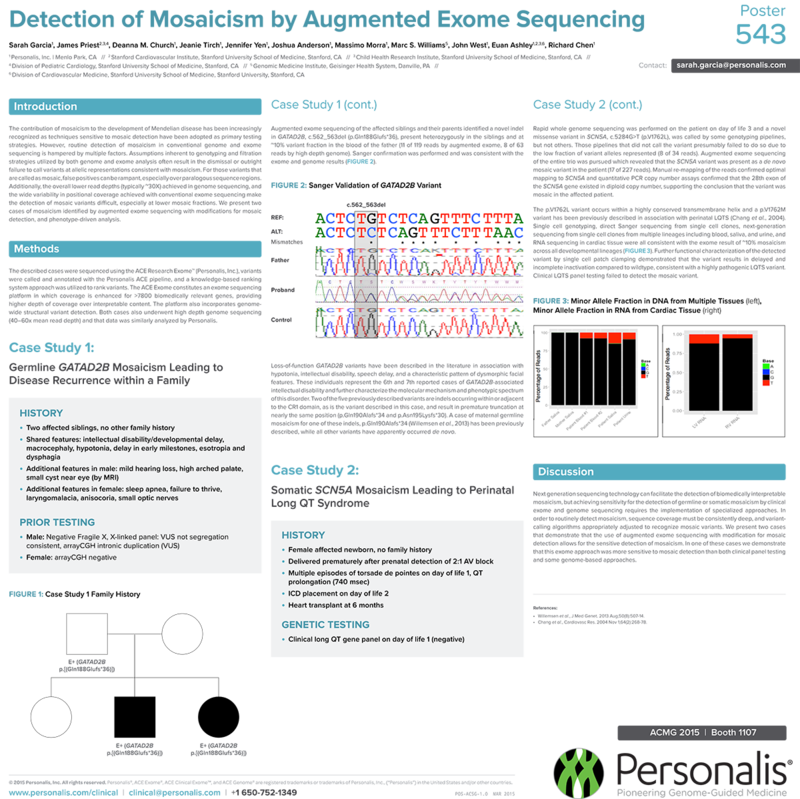 We present two cases of mosaicism identified by augmented exome sequencing with modifications for mosaic detection, and phenotype-driven analysis.